Dave Steffen knows hard traveling. He ought to. He's found the road a companion for thirty years. During this time Dave has played in clubs from Hawaii to Pound, Wisconsin, bringing his signature style of blues rock to many thousands of people across America. Born and raised in Wisconsin, Dave began playing guitar as a young boy, showing unusual talent even at a very early age. By the time he left high school, his band was signed to Scepter Records. Within five years, he had also released recordings with RCA and Mercury Records. 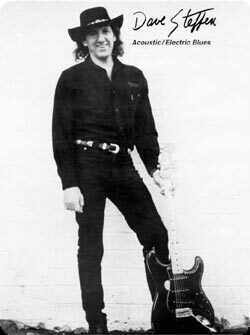 His talent as a songwriter and singer, in addition to his prowess as a guitar player, earned Steffen and his band special recognition in Billboard and Cashbox magazines and the Gavin Report. Dave continued to play venues in Wisconsin, opening for such national acts as Rush, Boston, Styx, and REO Speedwagon, as well as headlining his own shows. For several years Dave and his band continued to receive acclaim in clubs throughout the upper Midwest, including Chicago, Minneapolis, and Milwaukee. In 1986, the Dave Steffen Band headed west to the bright lights of San Francisco to experience the Bay-area music scene. During an adventurous nine-year stay, Dave worked with a variety of national musicians, opening for groups like Huey Lewis and the News, Santana, Ronnie Montrose, Robin Trower, and Journey. Guitar virtuosos like Carlos Santana and Neil Schon noticed in Dave a special giftedness as a guitarist, and on various occasions would come to his performances to jam with him in an intimate club setting. During this time, Dave continued to write and record his own music, releasing three album/CDs. In 1995 Dave returned to Wisconsin, back to his roots. Since that time, he has performed both with his band and as a solo act. His ability to adapt to so many music environments is the mark of a skilled professional. He continues to receive accolates from his peers in other bands. Just ask them. He connects with an audience not only because he is good, but also because he is a genuine performer. He gives people one hell of a show. In that, he has never failed. Like the dented blue Chevy van, which has carried his equipment 450,000 miles through three engines and twenty states, Dave, too, continues his hard traveling. He still has the power to amaze old friends and new fans with performances that show no signs at all of slowing down, not for a long, long time.